Credit: X-ray: NASA/CXC/CfA/M.Markevitch et al. ; Optical: NASA/STScI; Magellan/U.Arizona/D.Clowe et al. ; Lensing Map: NASA/STScI; ESO WFI; Magellan/U.Arizona/D.Clowe et al. 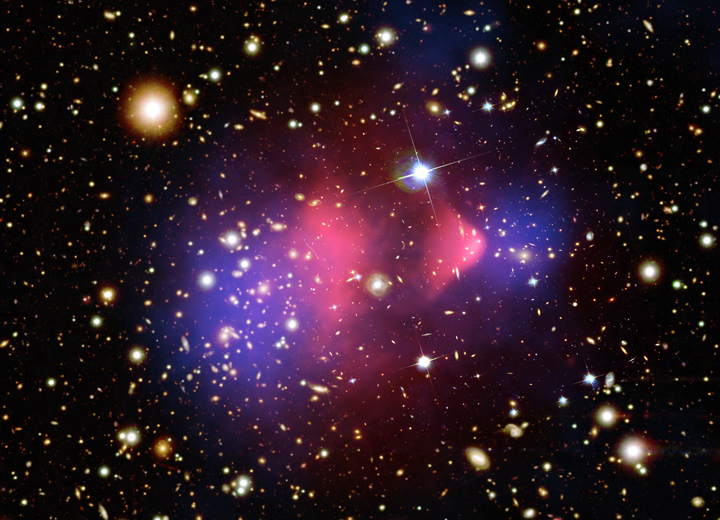 This composite image shows the galaxy cluster 1E 0657-56, also known as the "bullet cluster." This cluster was formed after the collision of two large clusters of galaxies, the most energetic event known in the universe since the Big Bang. Hot gas detected by Chandra in X-rays is seen as two pink clumps in the image and contains most of the "normal," or baryonic, matter in the two clusters. The bullet-shaped clump on the right is the hot gas from one cluster, which passed through the hot gas from the other larger cluster during the collision. An optical image from Magellan and the Hubble Space Telescope shows the galaxies in orange and white. The blue areas in this image show where astronomers find most of the mass in the clusters. The concentration of mass is determined using the effect of so-called gravitational lensing, where light from the distant objects is distorted by intervening matter. Most of the matter in the clusters (blue) is clearly separate from the normal matter (pink), giving direct evidence that nearly all of the matter in the clusters is dark. The hot gas in each cluster was slowed by a drag force, similar to air resistance, during the collision. In contrast, the dark matter was not slowed by the impact because it does not interact directly with itself or the gas except through gravity. 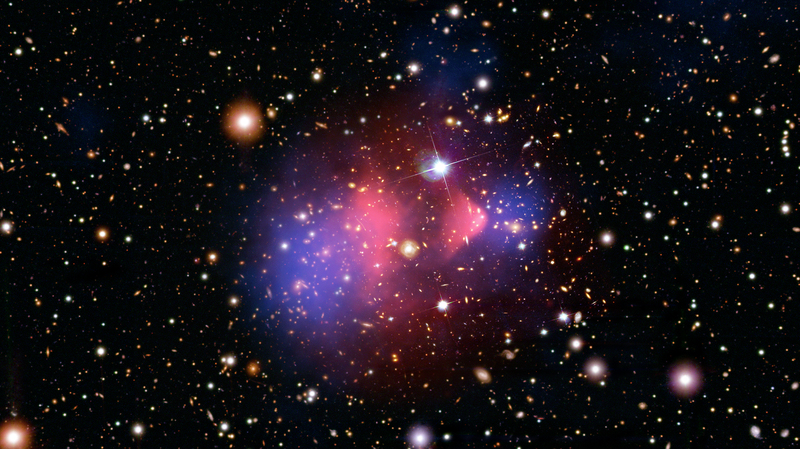 Therefore, during the collision the dark matter clumps from the two clusters moved ahead of the hot gas, producing the separation of the dark and normal matter seen in the image. If hot gas was the most massive component in the clusters, as proposed by alternative theories of gravity, such an effect would not be seen. Instead, this result shows that dark matter is required. 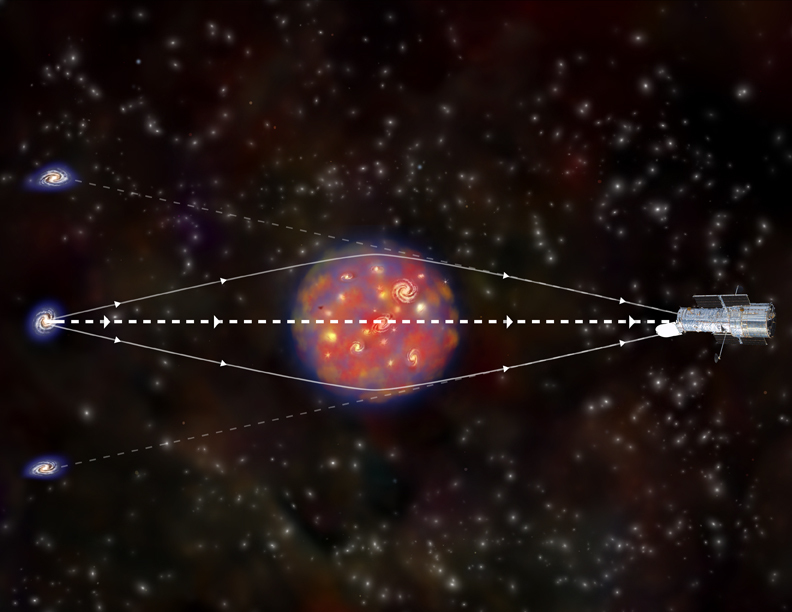 Credit X-ray: NASA/CXC/CfA/M.Markevitch et al. ; Optical: NASA/STScI; Magellan/U.Arizona/D.Clowe et al. ; Lensing Map: NASA/STScI; ESO WFI; Magellan/U.Arizona/D.Clowe et al. Coordinates (J2000) RA 06h 58m 37.9s | Dec -55° 57´ 00.00"